Home › Blog › How Are You Measuring Your Agile Talent Development? We are so excited to bring you our newest radar that focuses on how the HR department enables and drives Agility within an organization. We believe that this domain within an organization is one of the most critical components of an Agile transformation. No matter which Agile framework you favor, one common theme has to take front and center and that is the people aspect of Agile – employees, teams, leadership, culture, change, etc. – are the oil that is required to ensure a well-oiled machine. 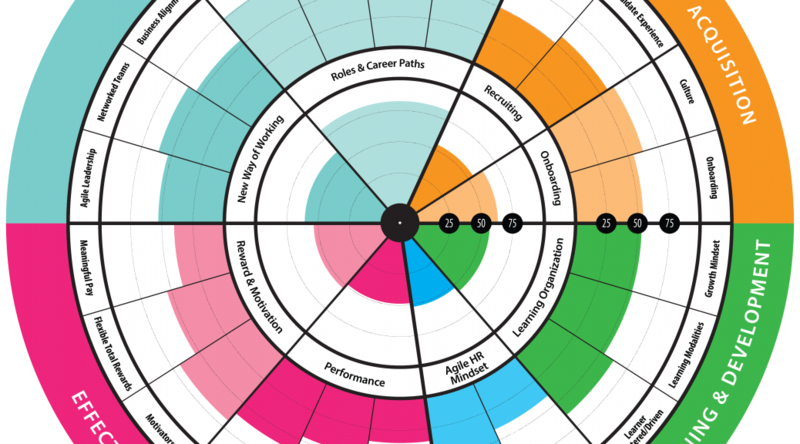 We launched our AgilityHealth® Agile Talent & HR Radar at our inaugural Agile Talent & HR Workshop (certified by ICAgile) on January 10-11, 2019, and the attendees were very excited to see a tool that could measure the health of their HR strategy and tactics in enabling Agile and the new ways of working in their organization. Organization Design – measuring how your organization has organized around collaborative teams, teams-of-teams and portfolios as well as building Agile specific roles into the structures e.g. scrum master, product owner, etc. In addition, how these structures are supported by a leadership team that supports a Lean-Agile Mindset. Talent Acquisition – measuring how your organization sources and creates a winning candidate experience through innovative sourcing techniques and backs this up with effective onboarding programs that embed the organization’s culture. Effective Performance – measuring how your organization moves from individual to team-based performance measurement that values consistent feedback based on outcomes and key results. To embed a high-performing culture, the radar also measures how to motivate and reward knowledge workers. Learning & Development – measuring how your organization moves to a learning organization through embracing a growth mindset and utilizing various learning modalities for employees to learn in a safe environment. Agile HR – measuring how your HR department enables Agile across the organization while simultaneously, embedding Agile practices into its own service delivery model so as to service its clients at a faster rate with value-added services and tools. We would love your feedback on the radar, so please use the following link to take the assessment with your team.